King Felipe and Queen Letizia arrived in Paris this morning for an official visit. This is the royal couple's fourth international trip since enthronement. Their Majesties were escorted to Élysée Palace, the official residence of the Head of State, where they were greeted by the French president, Francois Hollande. They also meet with the Prime Minister of France, Manuel Valls at his official residence, the Hôtel Matignon. 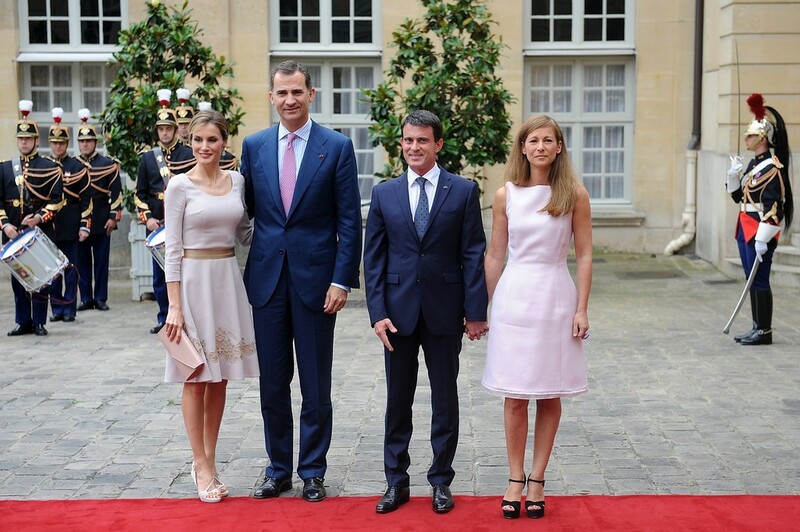 Letizia wore a blush pink Felipe Varela frock defined by a champagne sash belt and floral eyelet trim along the hem. The dress has a 1950's feminine silhouette with a scoop neckline and flared skirt. Doña Letizia coordinated the dress with a new pair of bespoke Magrit heels featuring a peep-toe opening and single cross-over strap. She also carried her Magrit patent blush envelope clutch. Queen Letizia completed her outfit with a stunning new pair of earrings. The earrings are by Spanish jeweler TOUS, designed by Rosa Oriol. The three tier drop earring feature ruby, emerald and moonstone, and are set in 18kt yellow gold.